Zibo United Tech Machinery Co., Ltd. - This type of shredder with functions of start, stop, reverse, overload reverse automatically, with feature return and overload returns automatically, with characteristics of big torque in low speed and low noise. Zibo United Tech Machinery Co., Ltd. ( www.utshredder.com )supplies kinds of quality drual shaft shredder with low price. 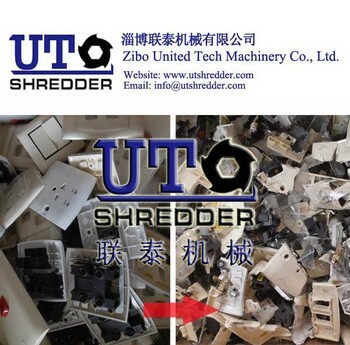 Zibo United Tech Machinery Co., Ltd. (www.utshredder.com) now offers different model waste electrical parts shredder with different capacity to meet the growing need for destruction of hard drive. The eletctrical components shredder are also available for other electronic devices, such as cell phones, handheld devices, laptop computers… Shredding is the most effective and desirable solution for destructing confidential information, offering maximum protection and eliminating any possibility of reconstruction or retrieval.